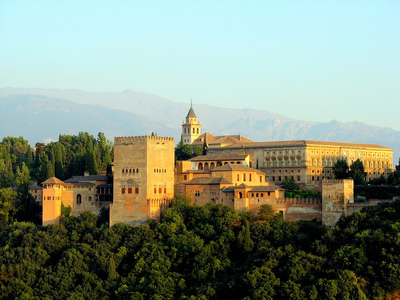 The 9th c.-14th c. CE Alhambra in Granada, symbol of Spain's eternal Islamic legacy. The Spanish Civil War is among the 20th-century military conflicts about which the most continues to be published, and in many languages. Often, new volumes on the three-year (1936-39) bloodbath recapitulate old themes: the ideological drama of fascist militarism versus a leftist republic; subversion of the republic by its alleged allies in Moscow; and heart-rending details of cruelty, on both sides of the trenches. Hitler's Shadow Empire is one of few recent studies offering fresh information, specifically describing German trade in the Franco-controlled zone. While it is typically assumed that Nazi Germany, like Stalinist Russia, became involved in the Spanish Civil War for ideological reasons, Pierpaolo Barbieri, an economic analyst, shows that the motives of the two main powers were quite different. His research took him to the German and Spanish archives, as well as those of Italy, Germany's partner in supporting the Spanish Nationalists. Soviet Russia did, indeed, want to bring the Spanish left, which was Western European in culture, into line with its habits of repression—and to the point of preferring a Republican defeat to the dominion of its anti-Stalinist rivals. In addition, Moscow influenced the Spanish republic because the republic had been refused military support by France. Barbieri passes lightly over Soviet mischief in Spain. But he demonstrates that Nazi Germany, starved of treasure and hard currency, and lacking foreign markets for its products, viewed Francisco Franco's Spain as an "informal colony" that would receive German goods while providing Germany with resources it badly needed. Those resources included iron ore, as well as other raw materials, and agricultural output. the later mass atrocities the Germans committed in Eastern Europe. It was, he writes, a contrast between Weltpolitik, or global strategy, and the ideology of Lebensraum—genocidal conquest—that obsessed Hitler and led to the horrors of the Holocaust and similar crimes. The difference, as recounted by Barbieri, was based in competition between a German economist with the improbable name of Hjalmar Horace Greeley Schacht, who was head of the Reichsbank, Germany's central economic institution, and a crowd of political demagogues who flattered Adolf Hitler by praising his vision of Germanization in the east. The main figure in this second group was Hermann Göring, who created a system of bloated, inefficient enterprises under his personal control. Hjalmar Schacht was a conservative economist, uninterested in internal Nazi quarrels. He favored German penetration of colonies where the Deutschmark would circulate as an exchange currency and from which resources would be exported to boost German production and consumption. That meant expansion in existing markets (including Argentina and the Balkans) and recovery of German colonies in Africa and the Pacific that were lost at the end of World War I. Some colonies could be "informal," or economic, retaining their own political systems and cultures, while others would be "formal," under complete German sovereignty. Göring and other Nazis, however, believed in Autarkie, a self-sufficient German bastion in the center of Europe that would provide a foundation for conquest and defense. Hitler, who was ignorant of economics, obviously preferred the melodramatic vision of a German fortress-state over a nation of vendors. Nevertheless, both Schacht and Göring favored German rearmament in defiance of the Versailles treaty. When the Spanish fighting began in mid-1936, Schacht was appointed minister of economics by Hitler. Schacht's policy of "informal empire" was soon applied to Nationalist Spain. With Hitler's approval, German aircraft and artillery were sent to Spanish Morocco, where the Nationalist General Franco's supporters were based, through a newly created private company: HISMA, a Spanish acronym for the Spanish-Moroccan Transport Company. In Berlin, a parallel firm, ROWAK—for its German title as the Raw Materials and Goods Buying Company—was established to receive payment from the Spanish Nationalists. This was Schachtian economics in microcosm. Barbieri describes HISMA and ROWAK as a "dual monopoly"—that is, German firms interested in Spanish business operations would sell to ROWAK, which would transfer goods to Nationalist Spain through HISMA. Both entities added generous commissions to their transactions. As "informal" as it might have been, the economic relationship between Nazi Germany and Nationalist Spain was not without problems. As long as Schacht was in charge of the German economy, the trade-based model prevailed, notwithstanding the rhetoric of Hitler, Franco, and Benito Mussolini about a common struggle against communism. The Nationalists were not blind to the reality that they were being robbed and cheated by Germany no less than the Republicans would be swindled by the Russians, who charged excessively for weapons and received payment in the form of Spain's gold bullion reserve, the fourth largest in the world. The Nationalists reacted to German avarice most often by acceding to German demands. Until 1937, Franco pressed the Germans for financial and trade arrangements that would reduce the burden of HISMA and ROWAK on the Spanish economy, and German vendors agreed in resenting the HISMA-ROWAK "dual monopoly." But Franco gave up when he realized it might threaten his necessary supply of German weapons. One problem for the Nationalists in dealing with a voracious Germany involved the Rio Tinto mining company, which was British owned. Germany was short of mining assets, and in September 1936, with the Spanish war only three months old, a Rio Tinto metals shipment was redirected from London to Hamburg with Nationalist authorization. As the civil war continued, the shift of Rio Tinto assets to Germany grew—a danger for Britain, since the metals involved would clearly be intended for German war industries. But of all the European powers that dealt with the Spanish war, Britain was the feeblest in its response. When Rio Tinto's chairman Sir Auckland Geddes wrote to the Foreign Office proposing British naval action to block the export of metals to Germany, Britain was mollified by a Francoist monthly payment of £10,000 in foreign exchange. But Spanish trade, mainly oriented to Britain before the civil war, was now to be placed fully in Germany's grasp. Both the Nationalists and the Republicans were victims of internal weaknesses and manipulated by outside forces. Nationalist Spain was at an economic disadvantage and forced to submit to Hjalmar Schacht's model of "informal colonization." Republican Spain was politically undermined by Soviet agents and was abandoned in 1938 as Stalin prepared for his non-aggression pact with Hitler, consummated the following year. Barbieri states that although the Spanish War was over by then, Franco and his colleagues were surprised at the sudden turn of their former patron, Hitler. Still, Francisco Franco won the war—and had his revenge on the Germans in 1940, when Spain refused to enter World War II as a full member of the Axis. As Stanley Payne described in his excellent Franco and Hitler (see "Spanish Revision," June 1, 2009), General Franco eluded the fulfillment of promises the Germans thought were ironbound. And as Pierpaolo Barbieri emphasizes, Hitler committed suicide in his burning capital in 1945 while Franco ruled Spain for 30 years more.